I'm sure a ton of people are going to feature this one this week but I just had to spotlight it! I've been waiting for a cover to do this post and now I can. I adore this series, it is probably one of my all time favorite series in the history of forever and I cannot wait to get my hands on this book! 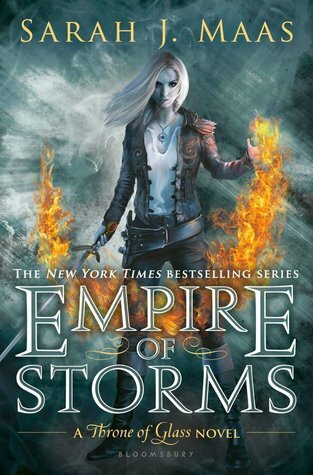 Empire Of Storms will be released on September 6, 2016. Second time today I am seeing this! Surprised it's not more! LOL! LOL! I was just typing my comment here when I got a notification that you commented on my post :D We're totally in sync today^^ I've been waiting for the cover to feature this one too! Definitely one of my all-time favorite series and considering the massive ACOMAF hangover, I NEED more Maas in my life ♥ September CANNOT get here fast enough!! A thousand times YES!!!! I cannot wait for more Aelin and Rowan and what the heck is going to happen with Dorian?! I need this one ASAP. Great pick! I wasn't a fan of the last book but I cant wait to continue the series! Yes great pick! I can't wait to get my hands on this book. I'm so excited/nervous to read what happens next! I really like this cover! I had been hoping for purple, but maybe for book six? ;) I'm hopelessly behind in this series so I may end up waiting for book six and then rereading books 1-3 and reading 3-6. I hope you enjoy this one when you get the chance to read it, Teresa! This one really looks good. I haven't started the series yet was trying to hold off until book six. The wait is killing me though. I almost picked this for this week's WoW, but I had a feeling everyone else would, too. lol Still -- best pick ever, wifey! I'm so behind in this series, but I'm kind of glad of that as well, I don't have to wait that much for the next book. I'll probably pick it up again once it's closer to the release of the final installment :) But my lord, I love that cover! Hope you love this latest installment of the series!